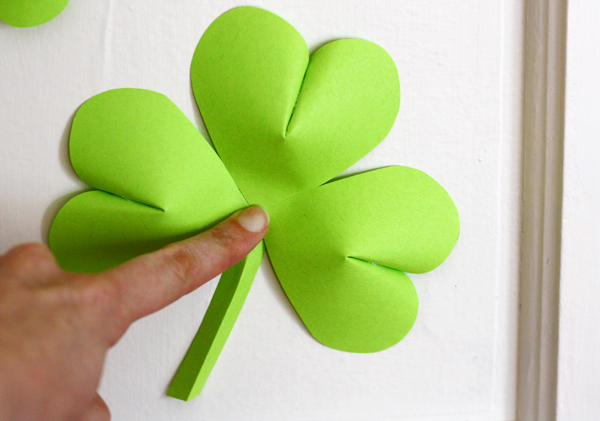 If you've got paper and tape, you can make some easy St. Patrick's Day decorations. Remember the wall of 3D paper hearts? You can use the same template to whip up some quick shamrocks. 1. 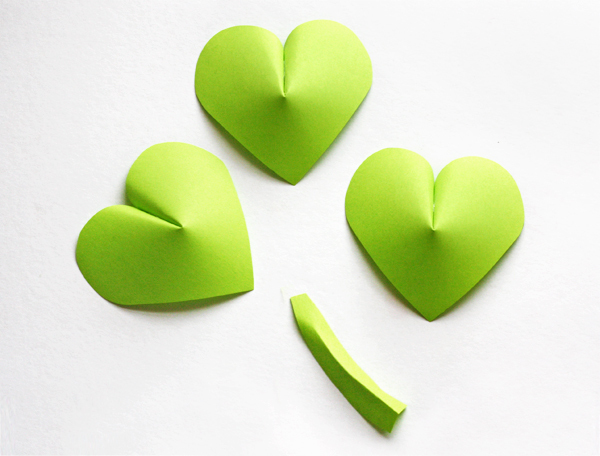 Download this heart template and print it on green paper. Or orange paper, if you want extra points. Nothing wrong with an orange shamrock, is there? 2. Follow the instructions in the original post for forming the hearts. 3. Cut some stem pieces and fold a crease most of the way up the center. These can be long rectangles, slightly curved if you like. Each shamrock requires three hearts and a stem. 4. Tape three hearts together so their points meet in the center. Tape a stem on top. 5. 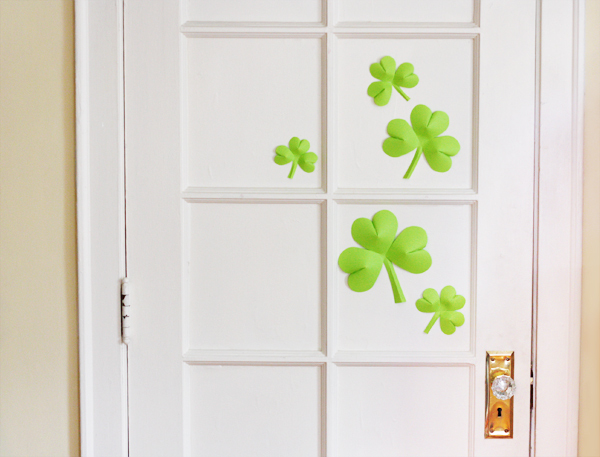 Apply wall putty or a rolled piece of tape to the center of the shamrock, and stick it to your wall. 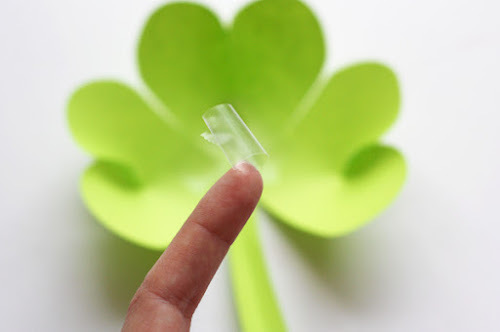 A surface covered with these would be awesome, and then you could call it an "installation" and get extra respect. But orange shamrocks would be soooo wrong!! Hey, did you notice your weird related posts from yesterday became today's, and yesterday got new ones? i'd use golden paper, that's what the colour on the irish flag is supposed to be. a nice, matte one would look cool with the green. Mum, yes! Apparently it takes the plug-in awhile to figure out which posts are ACTUALLY related, and in the meantime, it puts weird things up there. Ironically, one of the weird related posts reminded me of the Bloggie awards, and it looks like How About Orange is nominated again. Thank you, kind readers and nominators! Sylvi, I love your idea! Gold paper would be gorgeous. i suppose i should add "or so they say in the rebellious county cork" before this thread becomes filled with flag purists' upset comments. officially it is indeed orange. So cute! ^_^ I love the color but I only have white paper and some dark boring colors. Actually I think white would be elegant. I almost did white. It's the best for showing lights and shadows. Tons of paper sculpture artists only work in white. Very sweet! I think I'll try this with my daughter. I love these shamrocks, I tired to make the valentine hearts and they were hard to make. Best of "luck" to those that can make this decoration! These are just lovely, thank you for sharing! So super cute! Thanks for the quick and easy tutorial. Awesome. I didn't get to try the hearts for Valentine's Day. So now I will definitely try it for St. Patrick's Day! Thank you Jessica! 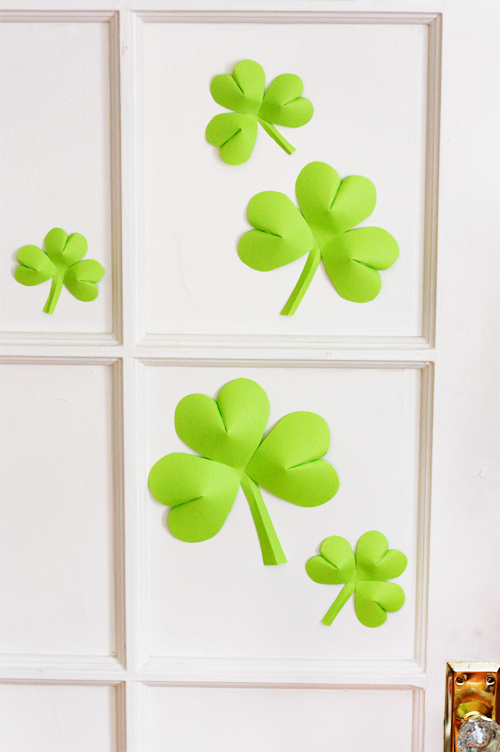 This will be a great "snowy day" activity to do with my daughter here in Colorado and the shamrocks will look so cute on our front door. I adore, thank you for this DIY! 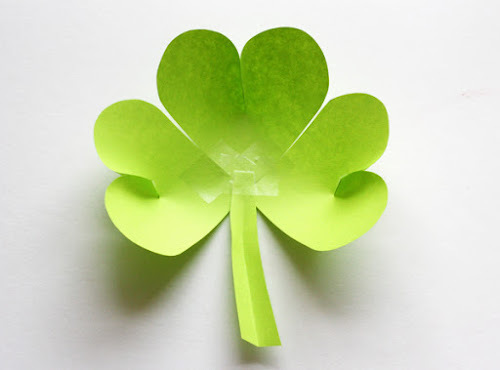 I shall like sharing your post on my blog (I make paper jewels), is it possible? Thank you! And thanks for sharing this project. Very kind of you! My post is online, thank you and have a good week-end! I adore, thank you for this DIY!And thanks for sharing this project!